With the groomed star personas carefully manipulated by the film studios of yesteryear it comes as a surprise that an actor could completely transcend his initial star image and yet keep his artistic integrity. Such an actor was Dirk Bogarde, whose roles in frothy comedies like the 'Doctor' films in the 1950s and early 1960s established him as a friendly face who would appeal to adults and children alike. Bogarde's abrupt change in star image was not, however, an overnight volte-face, for he had played more 'psychological' or 'serious' roles in his career before. This time, as the innocent Fifties became the establishment-challenging Sixties, Bogarde consolidated his position as one of Britain's foremost actors with several high-profile (and highly controversial) films. This new 7 disc release from Optimum Home Entertainment collects an intriguing cross-section of his British-made work from The Blue Lamp (1950) to Accident (1967) by way of Hunted(1952), The Sleeping Tiger(1954), The Spanish Gardener(1956), Victim(1961) and The Servant(1963), which reflect the more complex side of Bogarde's acting mastery. As well as being genuinely great films in their own right, the range of titles collected in this seventeen year span also chart the radical changes happening within Britain at the time. Thus, what is alluded to in The Spanish Gardener is the focus of Victim . For an actor as popular with the general film-going public as Bogarde, the roles he took on as the 1950s became the 1960s were both groundbreaking and astonishingly risky. These were not the contrasts between comedy and merely more serious roles (as in the case of Jim Carrey, a modern star name who has successfully made this difficult transition), but between what was socially debatable and what was socially reprehensible. Whilst any of the films in this collection would be worthy of being singled out for special praise, one title which is very much underrated is The Spanish Gardener. I first saw this wonderful film on television, the narrative disrupted by commercial breaks and the trappings of contemporary life. On DVD, without such distractions, it is a revelation. Reuniting Bogarde with Jon Whiteley, the child prodigy from Hunted four years previously, The Spanish Gardener tells the story of an overly protected diplomat's son who forms a friendship with the gardener. Shot in strikingly beautiful mid. 1950s technicolour, the film makes highly effective use of space and a moving camera to effortlessly capture the pleasures and pains of friendship. The introduction of Bogarde (playing the gardener, Jose) is simple but brilliantly visualised-a long shot of Jose's back leads to three cut ins, the last a mere second before he turns round. The notable space between the gardener and Harrington Brande (a superb performance by Michael Hordern) hints at their strained future relationship but also enables director Philip Leacock to revel in the glorious scenery which provides a fitting backdrop to the domestic drama. The Spanish Gardener (previously unavailable on DVD in the UK!) waiting in the retailers wings for their curtain call. 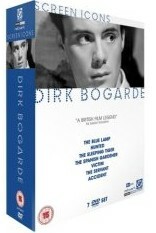 Dirk Bogarde was an undisputed cinematic icon in the 1950s-1960s but this set is not only for those who remember his days as a more complex matinee idol but for anyone who enjoys fine films with acting of the highest calibre. The seven discs boast excellent sharp picture quality which enhances them yet further. They enjoy clear, unmuddy sound and are conveniently packaged in a box with some extras (the excellent Dirk Bogarde In Conversation on the Victim DVD being a major example) as well as a detailed booklet. The set is available from Optimum Home Entertainment.